The fifth annual RIVIC Graduate School was held 16th-17th June 2014 in Swansea, setting a new record of 37 talks by students and researchers, with 3 keynote talks from Majid Mirmehdi (Bristol), Tim Weyrich (UCL) and Kurt Debattista (Warwick). 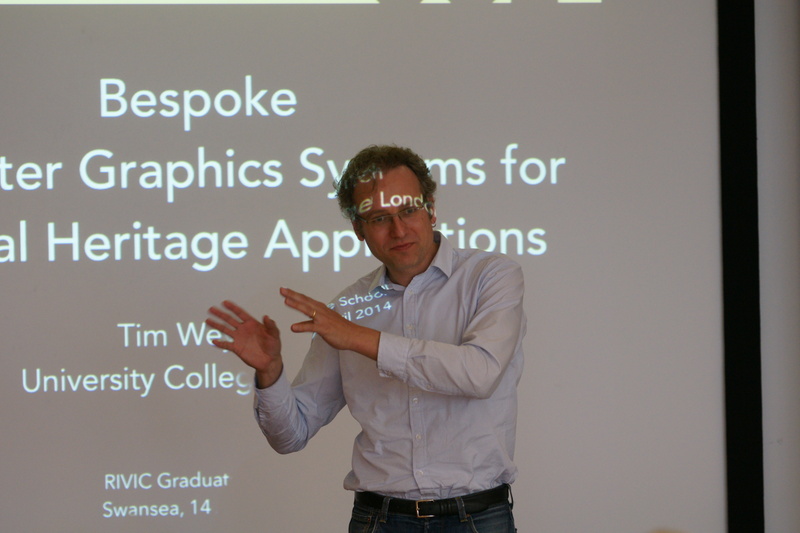 The event was arranged over two days in sunny Swansea with a wide range of talks in the topics of Vision, Graphics and Visualisation (Visual Computing). Our conference dinner was held in the Grape and Olive, the 27th floor of the Meridian tower offering superb views over Swansea bay, the city and local countryside. The RIVIC Graduate School is an excellent opportunity for researchers across the RIVIC sites (Swansea, Aberystwyth, Bangor and Cardiff) to meet up, discuss research projects, seek ideas and solutions, collaborate and generally see the active and varied Visual Computing research ongoing across Wales. We also have keynote talks from excellent researchers, including this year from Majid Mirmehdi (Bristol), Tim Weyrich (UCL) and Kurt Debattista (Warwick). Majid Mirmehdi (Bristol) spoke about the SPHERE project. In particular he gave a case study of using low cost consumer devices such as Kinect to measure progression of rehabilitation. The ultimate aim is to instrument houses with several sensors and video systems to monitor the health of occupants. He also gave some real-time automotive applications such as road sign detection and in car human/car interaction detection. 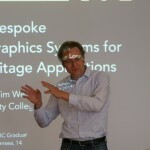 Tim Weyrich’s (UCL) talk “Bespoke Computer Graphics Systems for Cultural Heritage Applications” demonstrated how off-the-shelf devices can be re-engineered and integrated with novel software and algorithms to provide robust solutions to real-world heritage problems such as matching up smashed mosaic tiles to aid reconstruction and restoration work. Kurt Debattista’s (Warwick) talk “High-Fidelity Graphics” covered the past, current and future challenges for high quality global illumination rendering in terms of usability, computational load and adoption. Kurt contextualised his work with industrial experience in application areas of car model rendering (with Land Rover) and architectural applications (with Arup). This entry was posted in RIVIC Graduate School and tagged Computer Graphics, Computer Vision, Conference, RIVIC, Visualization on June 17, 2014 by Mark.